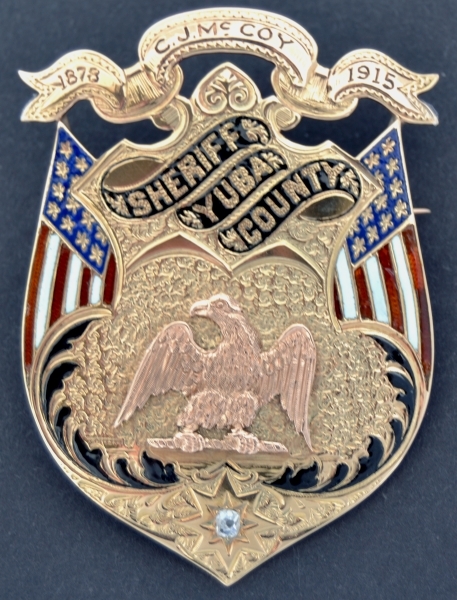 Above is the Marysville Police badge first worn by Marysville Policeman “Butch” Dobler, who was killed by a highwayman named “Mountain Scott” on June, 2, 1868. 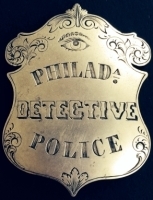 After Dobler’s death the badge was purchased from his widow by John Colford, Sr., who later sold it to Hank McCoy, who then wore it as a Policeman on the Marysville Police Department. McCoy’s son, Charles, would later wear it in 1900 serving in the same position. Charles J.McCoy, pictured to the right, one of California's native sons, having been born in Marysville, October 16, 1874. From April 2, 1900, until 1914, he served as police officer and Chief of the Police department of Marysville. In 1914 he was elected Sheriff of Yuba County, assuming his new duties as Sheriff in January 1915, a position he held for 32 years until 1946.
at once formed relief parties, and these parties hastened, armed, to the scene. residents terrorized by the awful events of the afternoon. arrest the leader. This time he received a reception even warmer than the first. was wounded in the arm, and was fortunate to escape with his life. volunteered to accompany the posse to the scene of the trouble. "keep the peace," he was shot down, and died almost instantly. one of the sheriff's deputies. being treated roughly, the committee well performed their disagreeable task. rest there till the arrival of the coroner. place, to Wheatland, where martial law reigned for several days. he received on "bloody Sunday" at Wheatland. Valley; W. H. Finch, eastern Yuba County; A. J. McCarty, Hammonton; C. E.
victims, with his wife, in a double murder, mentioned in this chapter; C. E.
Waldo; John J. Norton, of Marigold; and W. Bainbridge, of Rackerby. A. C.
were closely watched by the officers. take a part in any movement toward commutation of sentence or parole. representative from this district, then known as the Eighth Assembly District. as a member of the National Guard. in Yuba and the surrounding counties. conditions, proper housing, water supply, etc. 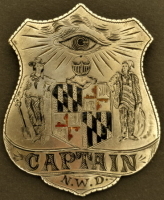 Above is the 14k gold badge worn by Hank McCoy who was elected in 1878. His son Charles J.McCoy followed in his footsteps and was elected Sheriff in 1914, a position he held for 32 years until 1946. Charles had a jeweler add the top ribbon and proudly wore the badge. 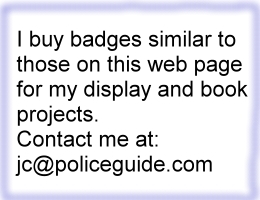 This badge is pictured in Witherell’s book, “California’s Best” on page 25.